Data Center Renovations are one path data center and IT managers can take to improve the performance of the underlying facility infrastructure to support IT load requirements, increase available space, and improve overall reliability of their facilities. While most of the time renovating a data center may be less expensive than building new, it’s still not unusual for costs to climb into the hundreds of thousands of dollars. Once preliminary goals are established for the renovation it is important to establish a realistic and thorough budget estimate. In a given year, more than 1/3rd of enterprises undertake data center renovation programs aimed at extending the life of existing data centers. Renovations typically address specific components in the facility to eliminate short-term issues such as power shortages, space limitations, and cooling constraints. As IT infrastructure is upgraded from stand-alone rack servers to blade servers, the facility supporting infrastructure is not necessarily upgraded at the same time. PTS’ Data Center Renovation approach begins with a thorough planning & feasibility phase prior to implementation of architectural and engineering services. This approach leverages the first five phases of the PTS data center project process for successful planning leading into cohesive design services which support client requirements. By focusing early on the KDCs required by IT systems and solutions with an eye on future requirements in years 2 – 5, PTS is able to work with clients to develop and implement Data Center Renovations that will support requirements for years to come. For example, PTS leverages Computational Fluid Dynamics (CFD) engineering design techniques to model the existing heat dissipation with current IT loads and considers future IT roll-outs and their impact on the proposed cooling solution implementation. 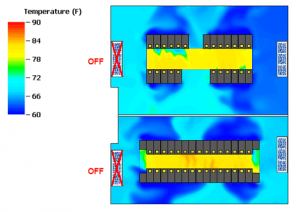 This allows our engineers to make consistent and solid recommendations on cooling system design for today’s load as well as anticipated future loads. After the design is completed and approved by the client, PTS provides construction management oversight to make sure building contractors implement to the engineered specifications. Many general contractors are not experts in the construction of mission critical facilities and PTS provides needed support and experience. Furthermore, PTS can support the project as orders are placed for generators, UPS, cooling, raised floor, and other facility supporting infrastructure. Support includes procurement, commissioning, and maintenance services. 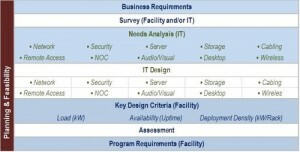 Following is a visual aid supporting our approach and how PTS maps out the critical design elements or key design criteria needed to successfully meet Data Center Renovation objectives.